Launched onto the road in California this summer, the Rplate Pro transforms the standard 125-year-old license plate into a sophisticated, sleek, digital, high definition display that allows consumers to view their vehicle’s telematics and customize the look of their plate by changing the background (black to white / white to black) and adding DMV-approved cause or personal messaging, such as ‘Support Our Troops,’ ‘God Bless America,’ or ‘I’d Rather Be Running.’ As a truly cutting-edge and unique aftermarket product, the Rplate integrates with today’s vehicle styles, offering new efficiencies and benefits to consumers, and its connected car platform automatically reflects registration renewals by replacing legacy stickers with digital decals, and adds new levels of personalization to the license plate. Reviver Auto’s mission is to bring new and far-reaching efficiencies, revolutionary marketing, and unprecedented connectivity to the auto industry through disruptive technology. 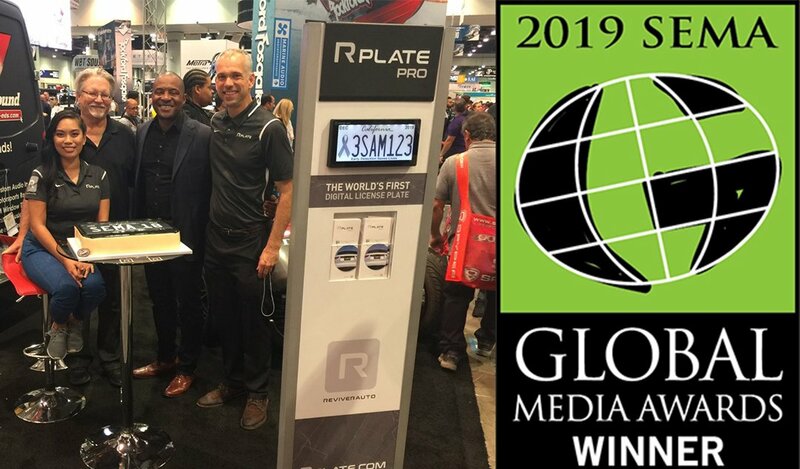 With its Rplate Pro™, the company has completely reinvented the 125-year-old stamped metal license plate into a connected car platform that digitizes and will soon automate the costly, often frustrating, and time-consuming DMV renewal process. Approved in California under pilot, the Rplate Pro also provides telematics functionality and brings a new level of personalization to the license plate. For more information, visit https://www.reviverauto.com.